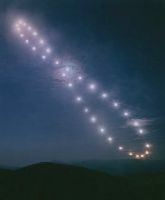 Analemma : "8"-shape figure drawed by the different positions of the sun recorded at a certain point in time (at 24 hour intervals) and from the same location in the course of the calendar year. This figure is not particular to Earth and can be visible, with other shapes (loop or teardrop) from other planets of the solar system. This article is a scoop and a true challenge on the technical side as never before such a result has been achieved. 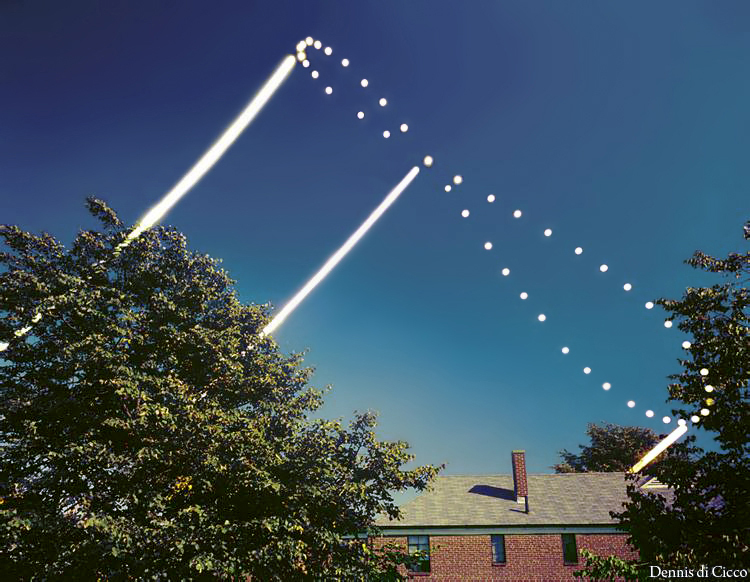 As amazing as it may seem, until 2002 only seven times has someone ever managed to successfully image the solar analemma as a multiexposure on a single piece of film and published his results. This daunting feat has been accomplished four times in the USA, once in Russia, once in Denmark and one more time in Britain. Since that time, other amateurs also succeeded to record it. Here are some among the few analemmas (not composite) recorded successfully so far. From above to below and from left to right multiples exposures pictured respectively by Dennis di Cicco, C.& T.Tezel who also recorded the total eclipse of the Sun of March 29, 2006 from Side in Turquey, Steve Irvine, V.Rumyantsev,Tom Matheson (a tribute to Dennis Di Cicco published in 2006), and Bjarne Høj Madsen. Having read and implicitly challenged that the analemma is one of the most difficult and demanding astronomical phenomenon to image, I immediately set out on such a task from my cottage villa just northeast of Athens, Greece (38.317° N, 23.800° E). As noted by Sky & Telescope Senior Editor Dennis di Cicco, "Most people say you have to be nuts to attempt a year-long exposure of the Sun. Those who have succeeded will probably agree" (S&T, March 2000, p135). Although I was eager to start on this project immediately upon reading the article (and challenge) by di Cicco, I would have to wait until the summer of 2001 when major construction work around my cottage would be complete. Apollo guiding his student by Elsie Russell, 1995. Regrettably, six months and roughly 200 total multi-exposures into the project (Dec 2001), adverse winter weather not experienced in four decades led to my missing an exposure which brought a disappointing end to my first attempt at replicating this unique feat. 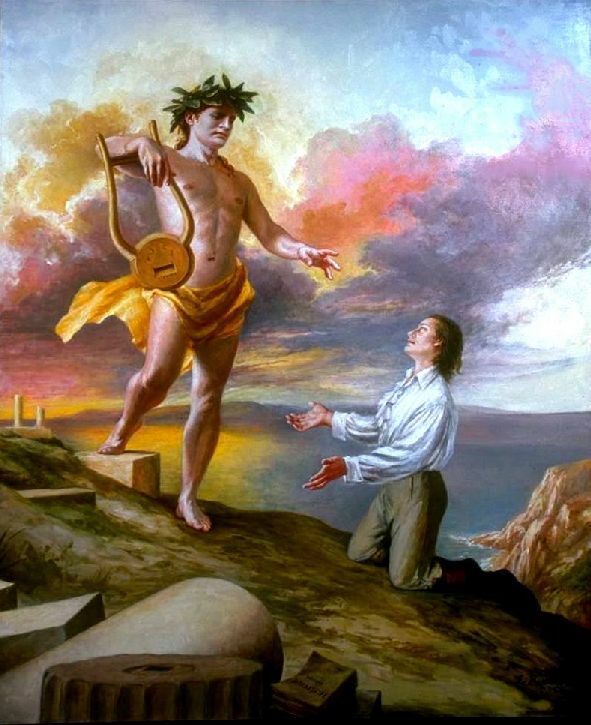 Having remembered that none one of the analemmas listed in the di Cicco article had been completed over twelve consecutive months of the same calendar year, I immediately reset my sites on a Jan/2002 restart using the trials and tribulations acquired during the first unsuccessful attempt. With the guiding force of "Απόλλων", son of Zeus and Leto and god of light (and the sun) in ancient Greek mythology, I was able to finally embrace the challenge inspired by the di Cicco article eleven times over the course of twelve consecutive months involving two Canon A-1 and five Canon AE-1 manual focus cameras and nearly 500 final multiple-exposures of our closest star. Furthermore, this Herculian effort and triumph, resembling a Sisyphean task a number of times thanks to numerous accidental film advances, was instrumental in providing the impetus for a return odyssey for three additional and very special analemmas projects currently under way involving 129, 139 and 52 multi-exposures each, respectively, also on a single piece of 35-mm film (24x36 mm). 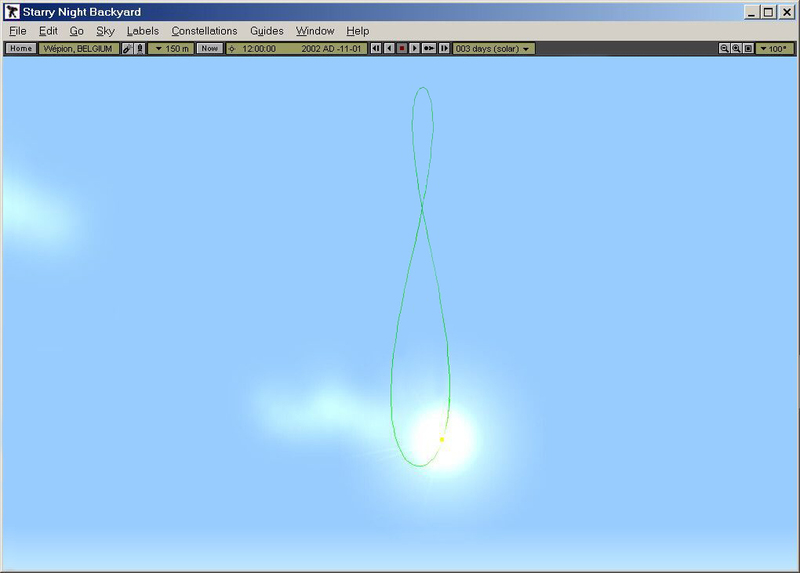 Waiting that Anthony's PC is up and running, let's remind that the shape of the analemma depends on the distance between the Earth and the Sun, the shape of the Earth's orbit and the way that the solar time is calculated. Let's take a picture of the Sun in a landscape. The vertical coordinate of the Sun is the solar declination (in its astronomical sense), its horizontal coordinate indicating the shift between the (apparent) solar time and the mean solar time (read of your watch). The difference between both times is called the equation of time and is due to the variation in the length of the synodical day (effect of the orbital eccentricity and the irregularity of the apparent move of the Sun across the sky). Add a correction for the mean solar time due to the fact that one determines a fictive solar position over the geographical equator whereas it moves along the ecliptic. It is thus necessary to take into account of the slope of the Earth' rotation axis over the ecliptic plane. 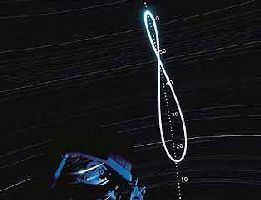 The shape of the analemma changes from one planet to another but does not depend directly on the latitude of the observer but rather of the time of the day and the time of the year considered. However, according to the geographical latitude of the observer, this large loop will be differently tilted over the horizon. That said, let's return to the work of the author. The analemma is the figure "8"-shape figure drawed by the different positions of the sun recorded at a certain point in time and from the same location over the course of the year. Due to the earth's tilt on its axis (23.5°) and its elliptical orbit around the Sun, the relative location of the Sun above the horizon is not constant from day to day when it is observed at the same time each day. 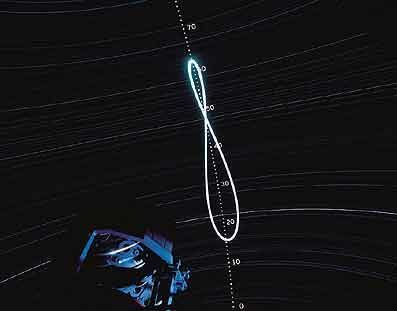 Depending on one's geographical latitude, this loop will be inclined at different angles. At right, analemma pictured in 2017 by Giuseppe Petricca. 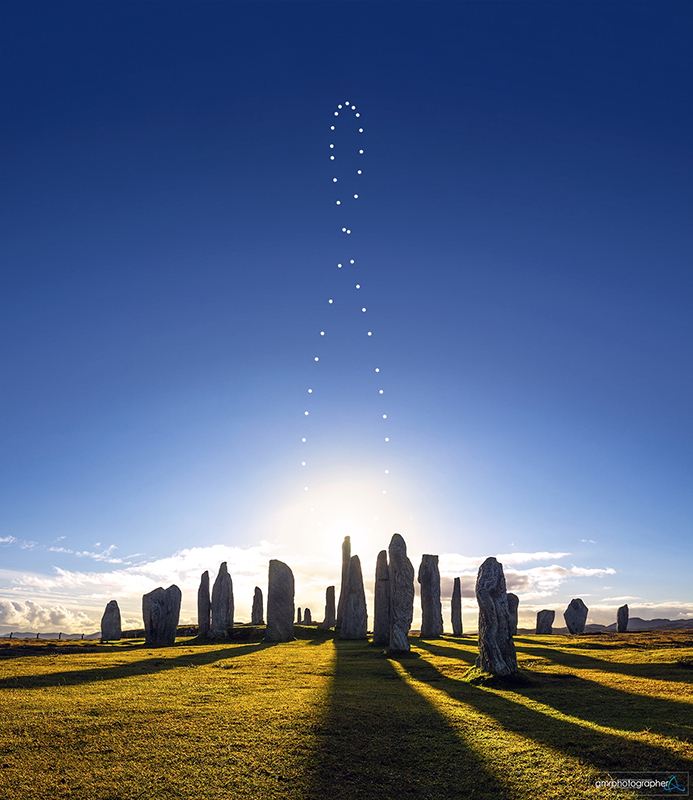 It is a composition of three panoramic images and 42 pictures of the Sun taken from the megalithic site of Callanish on the Isle of Lewis in the Hebrides (Scotland) using a DSLR Canon EOS 700D equipped with a Samyang lens 14 mm f/2.8 and mounted on a tripod. While planning for such an overwhelming technical and logistical exercise, I was about to discover a number of critical issues that must be addressed. 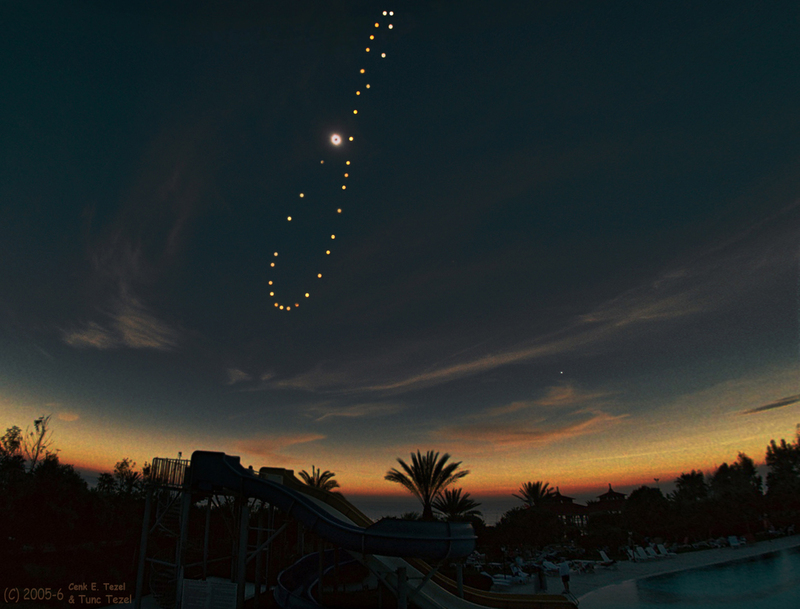 First and foremost is the composition of the analemma within the 35-mm frame. 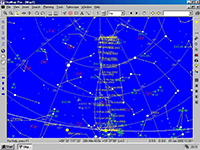 Using Chris Marriott's SkyMap Pro (Version 8) sky charting and planetarium software, I was able to determine the dates of minimum and maximum azimuth (i.e. 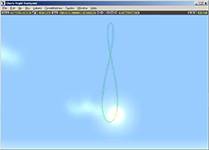 leftmost and rightmost analemma extrema) as well as the minimum and maximum altitude (i.e. lowermost and uppermost extrema) so as to identify the minimum field of view required and, therefore, maximum focal length lens to use. These extrema are dependent on the time of day that one proposes to shoot the time series and, as a result, we come to another key issue that must be addressed simultaneously. This latter issue is not as straightforward as it may seem since the rise and setting time of the sun complicates matters. Therefore, one must seek out the latest rise time as well as the earliest setting time and find a convenient compromise between these two extrema. For my situation, my latest rise time was at 05:41 UT (Jan 5 and 6, 2002) whereas my earliest setting time was at 15:05 UT (Dec 6 and 7, 2001) which led me to consider 06:00:00, 09:00:00 and 12:00:00 UT as initial potential targets. Analyzing the minimum and maximum azimuth and altitude alluded to earlier for these times over the course of twelve months made the final selection very easy since the latter two time candidates involved a maximum elevation of over 60° whereas the earliest time candidate had a maximum elevation of slightly over 30° (see Table 1). Of course, all of this proved to be immaterial a few weeks after the initiation of my first analemma as I would return with additional camera gear in an attempt to capture these analemmas as well. Having established the minimum and maximum azimuth and elevation and, therefore, range of solar movement in azimuth (39°44'18") and elevation (29°44'51") across the sky (Table 1), I had to identify the best focal length lens to use. Since 35-mm film is 24 mm high and 36 mm wide, a standard 50 mm lens is immediately ruled out since its field of view is 25°x37° (my range in azimuth is nearly 40°). In contrast, my Canon FD 24 mm f/2.8 wide angle lens provides a field of view which is 53°x74° and, therefore, the analemma would be occupying about 60 % of each dimension which not only permits for some flexibility (and/or error) in the placement of the analemma within the 35-mm frame but allows for a foreground effect to be added once the exercise has been completed. My choice for this lens would have a further benefit a few weeks later following the start of my first analemma as I would very pleasantly discover that the lens was ideal for capturing two analemmas perfectly and simultaneously if they were spaced one hour (or less) apart. The next issue to be addressed in this year-long exercise is the starting date. For aesthetic purposes and using SkyMap Pro again, I was able to determine that the precise crossover point between the two loops would be Aug 30, 2001. I feel this consideration is important so as not to "blur" the crossover point when traversing from the upper to the lower loop during the first part of the year and the return trip during the latter part of the year. Keeping this date now fixed in any shooting schedule I was about to implement, I directed my thoughts on the ends of the loops and, more specifically, the dates where the sun would be at the absolute apex (June 21, 2001 and Dec 21, 2001). Using these three points as now fixed, I set about to establish a shooting schedule so as to have as perfect a symmetry as possible both vertically and horizontally. 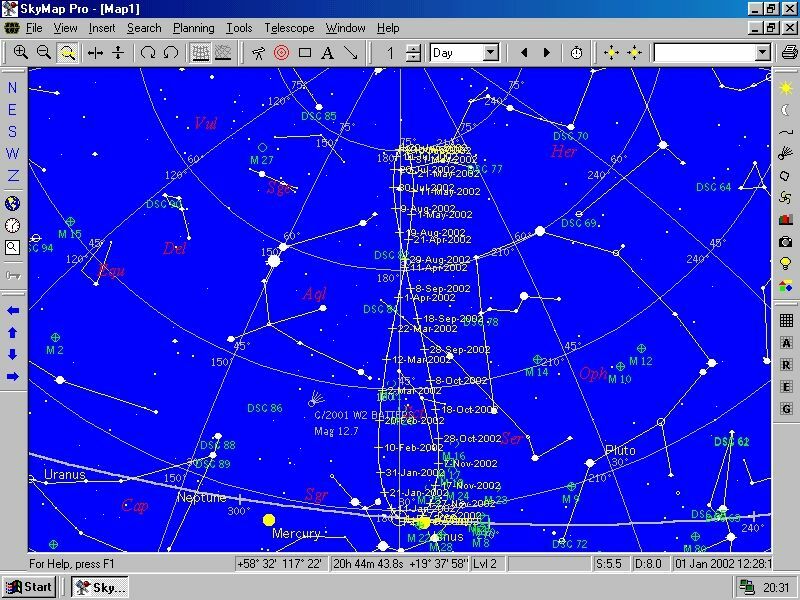 Three software among many others simulating analemmas : Kepler, Starry Night and Sky Map Pro used in this circumstance. Note that in all three simulations the analemme evolves around the meridian. 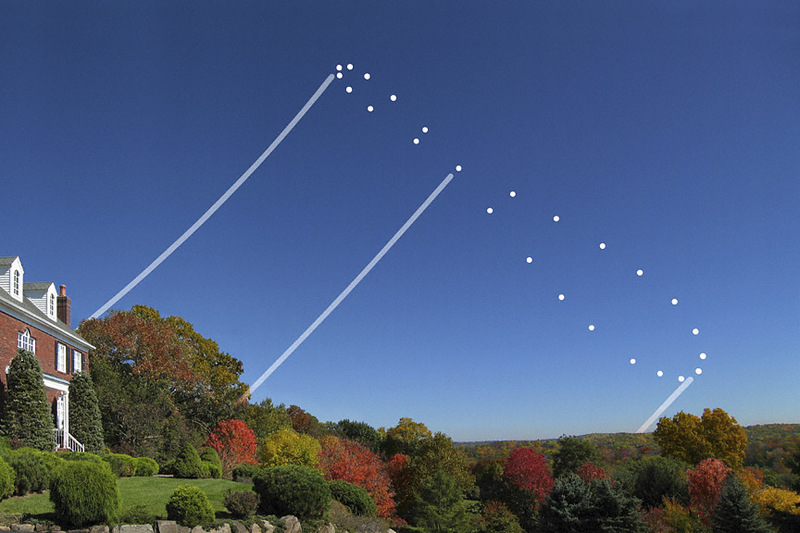 For the vertical equidistance, the ephemeris of the sun for 06:00:00 UT was used to establish the solar altitude at the summer solstice as well as the crossover point in the analemma; this figure was divided by 7 so as to get the degree offset (1.15°) needed in altitude between successive solar images for the left side of the summer loop. Similarly, for the winter loop, the difference in altitude between the cross-over point and winter solstice was established and the necessary divisor was determined to also yield an offset as close to 1.15° as possible (divisor of 18 yielding an offset of 1.16°). 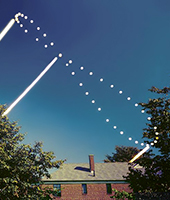 Using the crossover between the two loops as a starting point and the altitude of the sun on that day as radix, the altitude offsets were cumulatively added (for the summer loop) or subtracted (for the winter loop) and the corresponding day with that target altitude was identified and, coincidentally, the first half of the analemma schedule (in the form of an "S") had now been established. 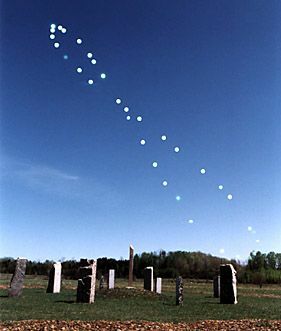 With respect to the horizontal symmetry between the two halves of each loop with one side of the two loops now defined as per the above, the task at hand was to simply identify the appropriate day that would represent a mirror image across the minor- or major axis of the analemma. 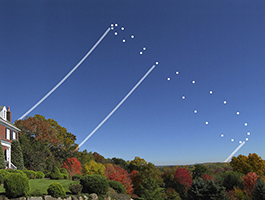 The ephemeris for the perfectly vertical analemma on the meridian (10:28:16 UT) was then consulted where it became a trivial exercise of identifying dates whose altitude complemented precisely the altitude established for the first half of the analemma. With a complete set of dates now identified which allow for the loops to be evenly cut cross-sectionally in both dimensions (Table 2), a rigorous schedule between June 21, 2001 and June 05, 2002 representing 43 imaging sessions of the solar disk was carved in stone (the intended frequency for the lower and larger loop was adjusted downwards very slightly - 17 to 14 images per side - following further analysis so as to make the analemma slightly more attractive). 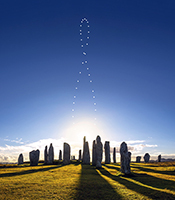 My initial attempts at establishing a shooting schedule to yield perfect symmetry vertically and horizontally was based on the calculation of the slope of the minor and major axis of the 06:00:00 UT analemma (m=-0.582879 and m=-0.817589 respectively, "m" being the slope angle and the use of these slopes in conjunction with the mathematical principle that the product of two perpendicular slopes (major/minor axis vs. the cross-sectional lines connecting mirror images) must equal -1. However, this presupposes that azimuth and altitude are rectangular coordinates which is not the case. Nevertheless, a rather good approximation can be obtained ! Anthony raises an interesting "cultural" difference in the notation between the U.S. and e.g. Europe. In most European schools in maths and stats this "m" factor is noted "a" like in the formula y = ax + b. Let's explain the principle too. Take for example the upper and smaller loop, pick a date (ex. May 12, 2002) ... now choose any point on the other side of the same loop, ex July 27, 2002, and compute the slope of the line from the May 12, 2002 to the July 27, 2002 date ... take this slope and multiply it by -0.5879 and see if it is -1.00 (or close to it). The approximation was done using Excel and in listing all key dates. The above calculation was then performed on each date and Anthony selected the one being equal to -1.00.